If you’re looking for ways to cut down content noise, adding visual content is perhaps the best thing that you can do to your marketing strategy. Marketers who are marketing on a modest budget can take resort to interactive data, videos and online courses. Infographics are not just reasonable and affordable but the best thing about them is that they can be reused through different marketing channels, whether in blog posts, social media or in newsletters. 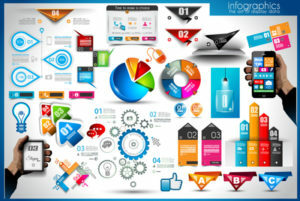 This will let you get the maximum engagement from your investment in infographics. Infographics – How do sites and blogs benefit? You must be wondering about how infographics perform so well with content marketing campaigns. Infographics usually garner more engagement on social networking sites as compared to any other type of content and you will see the acceptance in the form of shares, likes and comments. The more the users engage with your post, the more is the visibility that your website will get and hence an infographic can heighten the reach of your post and make it viral in no time. One more benefit of using infographics is that when you use graphs, timelines, diagrams and charts, you make complicated details more digestible to the readers. Although they seem to be extremely effectively, just incorporating them into your marketing strategy is not a magic bullet. You have to make sure you promote them with your best efforts if you wish to maximize its success rate. Remember that an infographic designed in the best manner is nothing but a piece of trash if noone cares about the details it has within it. If you wish to roll the ball, you have to quickly search the internet for knowing the most popular content. Know what is relevant to your niche and then type a keyword which is perfectly relevant to your content. This is the way of finding trending topics and hitting the bull’s eye! When you get a suitable topic on which you can work, the very next step that you have to take is to scribble down an interesting script for the infographic. Don’t forget the fact that the quality of the infographic is decided not just by the way you design it but the text also plays a vital role. There should be an attractive headline, an introduction, content that is fully driven by data, sources of data and other tips for the readers. Just as any type of online content, you will be able to maximize the infographic’s visibility through different distribution channels like your own blog. As per recent statistics, infographics tend to be 30 times more readable than normal blog posts. Not remembering to feature the infographic is your blog is perhaps the biggest mistake that you can make. For this, you have to load the entire content management system and embed the infographic within the new blog post. You just need to launch social media ads and reach out to more people. This makes it easier for the audience to share infographic. The best way out is to embed different social sharing buttons so that the infographic can be shared on social networking sites from the blog post. Therefore, if you’re wondering about the different ways in which you can promote your infographic, you can take into account the above mentioned advice from experts.